Part 2 of my restaurant reviews while I spent a week in Baltimore for work. A colleague in the Baltimore office recommended this restaurant and did mention it was quite high end - she wasn't kidding! It's a sophisticated, upmarket restaurant with an amazing seafood menu and impeccable service, though the low lighting made it difficult to read my Kindle while I was waiting for my food (I was dining alone). I hadn't made a reservation and offered to eat at the bar where some people were dining but they showed me to a booth. 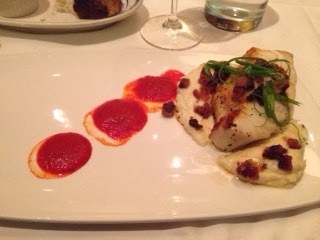 I ordered the Chilean sea bass with pureed cauliflower and candied bacon, which was pretty expensive at $39, but it tasted divine - the bacon was sweet and salty at the same time which worked surprisingly well! I ordered a side dish of Yukon mashed potatoes with sour cream to go with it; the potatoes were more crushed than mashed and tasted perfect (though that was another $8!). I asked for a glass of house wine and I'm not sure if I was misunderstood or if their house wine is very expensive as it was only when I got the bill at the end that I found out the glass of wine they brought me was $16 (about £12!). 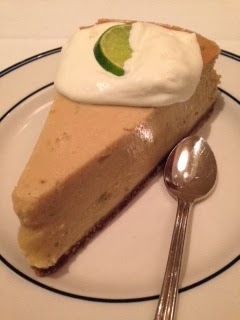 The dessert menu had "cookies and milk" which was intriguing as I'm sure it would have been served in cordon bleu style; instead I went for the key lime pie, which at $9.95 was actually good value as the slice of pie was so large it would have been enough for three people. It was an excellent meal, probably one of the best I've ever had, and I would highly recommend this restaurant (just be prepared when you get the bill!). I'm not one for big breakfasts so most day I got a cup of good old English breakfast tea and a pastry from Starbucks. There was a small Starbucks concession in the lobby of my hotel which was perfect as I could grab something to eat on my way out in the mornings. As it was a small concession there were only a few choices of pastries and muffins but they were different every day. 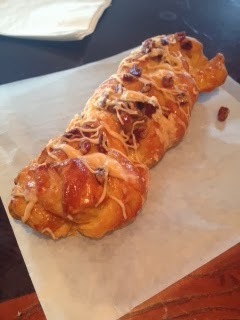 One day I saw something that looked interesting and asked what it was - it turned out to be a bear claw. I'd heard of these, for instance from the Big Bang Theory where Penny tells Sheldon her workout regime is to "run until I'm hungry, then I stop for a bear claw". I was pleased therefore to finally be able to try one! It was an almond-flavoured pastry with icing and chopped pecans on top, and absolutely gorgeous. I went here for lunch with a colleague; it's really a fast food restaurant but different to what I would normally class as fast food because it serves noodles and pasta dishes and the meal is brought to your table. If you want a soft drink you help yourself from the Coca-Cola Freestyle machine I described in a review of Burger King (as I'd never come across it before). The food is a mixture of Asian and American e.g. 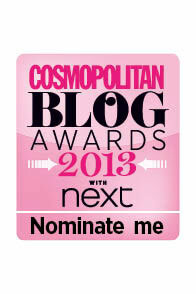 Pad Thai or macaroni cheese. I had the latter with a side order of meatballs as suggested by their menu; the meatballs tasted a little processed but the portion was huge and the cheese sauce on the pasta very tasty, so I'd say it's a good place for a cheap and filling lunch. 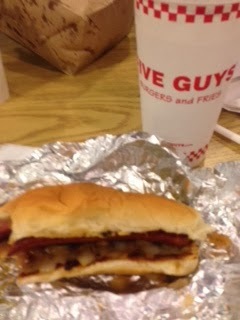 I've already written a review of Five Guys after I went to their first London location this summer, so I was looking forward to comparing one in the US. This burger chain is well known in the US but only recently opened its first branch in the UK, in London's Covent Garden. The menu is very limited as the restaurant prides itself on doing a few things well. You can have a burger or a cheeseburger - be warned a double patty in your burger is standard and you have to order the small burger if you want a single patty. They also have hotdogs, and either plain or Cajun spiced fries. There is a long list of toppings you can choose from, ranging from onions and ketchup to jalapeno peppers and grilled mushrooms; as I'm very fussy I'm glad that nothing (even ketchup) is added as standard and you customise it however you like. I actually ate here twice, once early in the week as I was shopping and sightseeing until late and wanted a quick dinner near my hotel (Five Guys was right across the road) and then again on the night my boyfriend flew in, as he wanted dinner but was too tired to wait for service in a restaurant. On the first occasion I had a cheeseburger and Cajun fries - I'm sure they were more spicy than when I had them in the UK, come to think of it I'm sure the portion was a lot bigger too - and the second time I had a hot dog, which was good but I preferred the burger. They have the Coca-Cola Freestyle drinks machine here too, which allows you to mix all sorts of flavours - like a raspberry Sprite or an orange Coke. I was really looking forward to eating here, as I'm a fan of Big Bang Theory, but also because I ate in a Cheesecake Factory last year in Las Vegas and liked it so much I went back a second time. Given this branch was right across the road from my hotel, how many times do you think I went here in a week? Um...... (blushes) three! Though in my defence, twice was just for dessert and I only had one proper meal there. 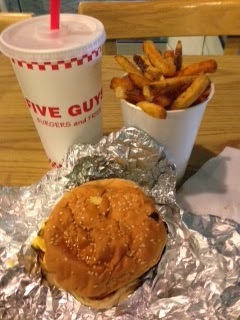 So the first time I went, I had gone shopping after I finished work and when it got late, wanted a fast dinner somewhere nearby, so I went to Five Guys for a burger. 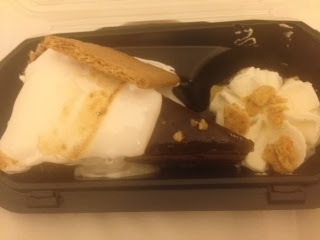 The Cheesecake Factory is in the same building on the harbourfront so I decided to pick up dessert and eat it back in my hotel room across the road (is it any wonder I put on some weight while I was there?!). They have a vast menu of cheesecakes, which you can see in a display counter. After some deliberation, I chose the "toasted marshmallow s'mores galore". S'mores are toasted marshmallows sandwiched between two Graham crackers (which are like digestive biscuits). The cheesecake had a biscuit base, a lovely creamy cheesecake layer and then chocolate and melted marshmallow on top. It was very rich and decadent and I could only eat half of it! The second time I went was when my boyfriend flew in; he got to the hotel around 7pm but with the time difference it felt like 2am for him. He hadn't eaten at all on the plane so was very hungry, and didn't want to wait to be served in a restaurant so we went to Five Guys. 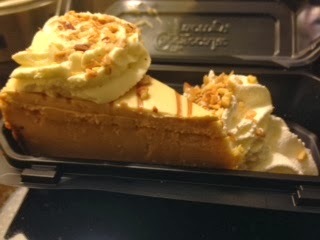 He then wanted to get dessert from the Cheesecake Factory so as before we bought a slice each and took it back to the hotel room. He chose the chocolate tuxedo cream cheesecake, which has layers of fudge cake, chocolate cheesecake, vanilla mascarpone mousse and chocolate. I tasted a little and it was a bit rich for me (but nonetheless amazing) but he managed to eat the whole thing. This time I had the dulce de leche caramel cheesecake, which tasted a lot lighter than the chocolate and marshmallow one I had previously, and it was just as creamy and delicious. The cheesecake isn't cheap at about $9 a slice but it really is worth it. And for our third and final visit we actually went for dinner, after visiting the very impressive Baltimore aquarium. The service in the restaurant was friendly and attentive; the way the waiter took my boyfriend's empty glass and exchanged it for a full one was particularly smooth (almost blink and you miss it!). The menu is absolutely huge and takes a long time to read, though it is divided into different sections and they do have one section for people who are watching their calories - then of course the cheesecake menu itself which is amazing. 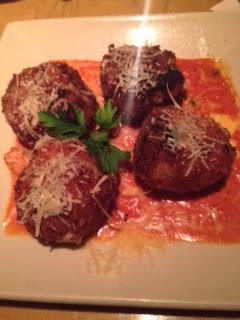 I decided that I wanted to try the deep fried macaroni cheese balls to start; they were delicious but very filling and I don't even want to think about the calories. 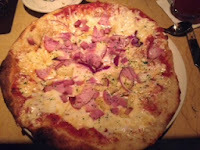 To follow, I had a Hawaiian pizza which was so large that after eating most of the starter (as my boyfriend decided to save room for dessert) I only ate a quarter of the pizza. 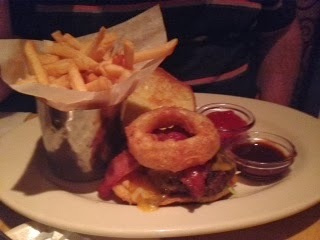 My boyfriend had a BBQ bacon cheeseburger which came with a giant onion ring in the burger as well; he really enjoyed it. He wanted dessert but I was stuffed so he got a piece of cheesecake to go and ate it in our hotel room. This time he had the oreo cheesecake, which I tried to recreate in this recipe; he said this was his favourite dessert from the Cheesecake Factory. As you can tell given the number of times I went there, I really like this restaurant. A colleague in my company's US office described it as "very American - the menu is too big, the portions are too big, and it's a guilty pleasure but it's awesome." 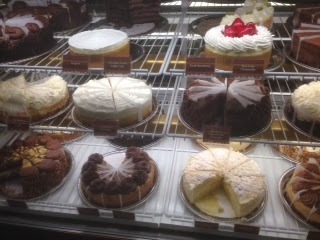 I highly recommend you go if you ever get the chance- and I wish we would get a Cheesecake Factory in London! Me too! love cheesecake factory so much! Your s'mores one looked amazing! Byron and I have been known to share a piece of their cake and take 2 days to eat it before because they are that huge! haha...and oh my I'm dying over your piece of key lime pie...I have never had a good piece of key lime pie served to me in a restaurant over here, the UK just doesn't get it! I'm so jeal!